不可完成的任务9：打败北京顺义国际的邪恶的马桶！/ Mission Impossible 9: fighting the evil toilet! Although there are many efforts made at ISB to protect the environment, there are some areas where changes are necessary. One of the aspects which require adjustments is the toilet. The toilet is automatically flushed since there’s a sensitive sensor on it so that you don’t need to press in order to flush the toilet. If you get near it, the sensor detects you and flushes the toilet. However, this astonishing toilet has one dilemma it suffers from. 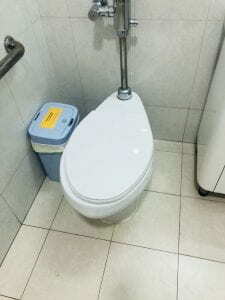 In some cases, even when people do not have to use the toilet (which means pooping), the sensor can detect you if you get close then flush by itself. This is a colossal waste of water if it continues. Currently the Earth is covered in 70% water, but only 1% is available for drinking and using. ISB should find an effective and efficient solution to address this issue at hand as fast as possible. 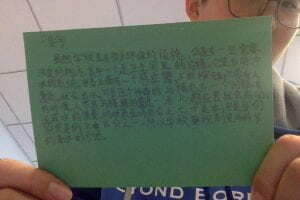 Posted on April 10, 2019 April 12, 2019 Categories UncategorizedLeave a comment on 不可完成的任务9：打败北京顺义国际的邪恶的马桶！/ Mission Impossible 9: fighting the evil toilet! My biggest obstacle was when my entire project was impossible to be 3D printed out because it was way too big and will take a long time (about 32 hours). I was dumbfounded and did not know what to do, but then I decided to use wood. I finished my base using wood first, then I got my 3D printed objects and hot-glued them together. One thing I would like to change is the angle of the hole in the 3D printed rectangular prism. I miscalculated which led to the hole being too slanted. This steep hole is not very beneficial when it comes to placing things inside. For example, you can only place materials that has a lot of friction, such as an eraser. If it was less steep, my client would’ve been able to put his house keys inside. There are two skills I have learned or developed which are wood cutting and how to react when unexpected situations occurs. Before design tech, I was afraid to even handle a saw, but after this experience, I can properly saw wood using a grappler. Also, I had to think and decide fast what to do for the base. So, while my little things were getting printed, I worked on my base, combining and coloring it. I learned that reacting quickly is essential and that these skills will eventually help us later in the future also. One piece of advice I would give a future student doing this project is to consider your efficiency and how much time it will take. When I realized that my portion of the project won’t work through 3D printing, I had to hastily make the base out of wood. If you aren’t quick and efficient enough, you might need to make your final product out of cardboard. So organize your time wisely and do not think too long about what you should do, or else you will not be able to finish it. In my third chunk, I finished my artwork. I added some backgrounds also, which is a roll of lightning. Although the eyes are sort of small, I think it is okay. 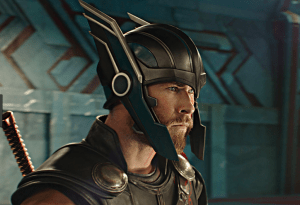 (But it doesn’t look like Chris Hemsworth!!!!!!!) I used the tortillons a lot, to give the overall texture of metal and skin. I also tried my best to give a contrast in the skin tone so that it looks natural. My overall feeling about this painting is okay since I wanted it to look like the actor Chris Hemsworth. But, although the face is kind of different, I still feel as if I successfully reached my goal which was to draw with more detail using grids. This is my current progress, I finished sketching and elaborating, and I am almost done with toning. 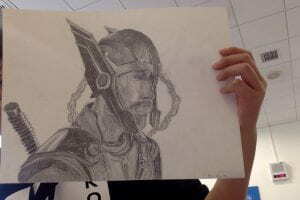 Although Thor doesn’t exactly look like Chris Hemsworth (looks like a different actor) I feel pretty proud. I also took a piece of advice and used tortillons to smudge and give a different texture. This photo below is my progress. I currently have 3 more chunks left. I think I did quite good since I finished the basic sketching, and also went into some beginning stages of detailed drawing as my plan. I sketched according to the grid, and it helped me a lot. I’d use HB pencils for sketching and 4B for toning. The paper will be about 36.7cm by 27.5cm. I will first draw grids on top of the printed out black and white photograph and draw a grid on my paper also so that it can be proportionate. 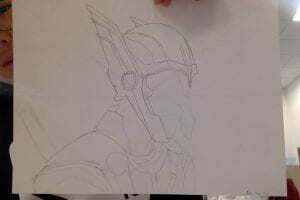 I will sketch the grid lines lightly so that it’ll be easier to erase it or leave it. I will then start toning and I’ll be done. I have 4 chunks of time, so during the first chunk, I’d start with creating grids and sketching. I would possibly start my detailed drawing. In the second chunk, I would most likely continue drawing and elaborating. This will take the most time. Then, in the third chunk, I’d finish drawing and start toning at the end of the chunk. Then, at the last chunk, I would finish with toning, and I’ll be done. This photo is my inspiration for my detailed drawing. It should not really express any emotions or feelings since my goal is to practice to draw as realistically as possible through grid drawings. 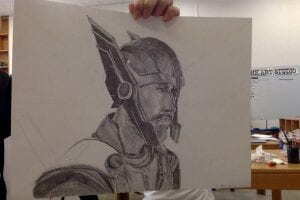 (Humans were always hard to draw for me and since I am a Marvel fan, I tried Thor) Because it is a realistic drawing, I would want a normal paper and possibly use a HB or 2B pencil for sketching and 4B for toning. Do you know what is stroke? Stroke is one of the top 5 diseases which causes death. Stroke happens when blood flows to an area of the brain is cut off. Then, the brain cells are deprived of oxygen and begin to die. I found out that foods that are bad for strokes contain high sugar, salt and oil, (fattening foods) for example, hamburgers, sodium etc. The foods that can prevent foods were mostly vegetables and fruit. But the interesting fact is that dark chocolate and diet drink can prevent stroke because they contain less sugar. If you eat as the nutrition table says, you can at least lessen the possibility of getting a disease or sick. Disease is like a dripping tap. But most doctors try to mop the ground. They don’t tell you how to turn off the tap, and that’s the problem. It’s about how to treat the cause, not curing the disease. That’s why it is important to eat healthy foods. 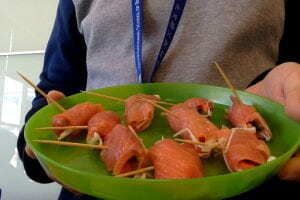 My salmon rolls. It has stuffings of top mushrooms, cucumbers, and carrots. I made this to share because the ingredients do not contain that much sugar or salt. 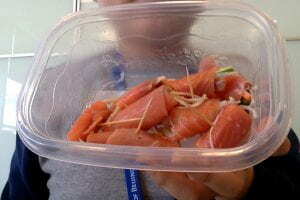 The salmon eases your brain flow, the top mushroom prevents hardening of arteries, the carrots contains vitamin A and C, and the cucumber can reduce the possibility of getting a cancer. This dish is relevant to me because my family likes fish. Posted on July 28, 2016 Categories Uncategorized1 Comment on Hello world!